This month, we have a slew of new features that will save you and your company a ton of time – both in your day-to-day life and when you’re under pressure and every minute counts. We’ll start off with some new ways to ensure quality: a brand new QA Dashboard and the introduction of Formula Checkpoints. Next, we have a series of enhancements to the way corrective actions work. Icicle also has new ways to assign tasks faster and easier and also new ways to streamline shipping, receiving, and procurement through things like automatic Inventory Unit Conversions and Purchasing Suggestions. These Icicle features continue to help you maximize efficiency and reduce costly human error. We’ll end with some nice little comment fields that make communication easier. What does it do? Icicle has recently released a series of new dashboards to help you manage your business better – from production to sales – and we are proud to announce the release of a new QA Dashboard! The new QA Dashboard allows you to see a variety of key performance indicators related to corrective actions, root cause analysis, and preventative measures. 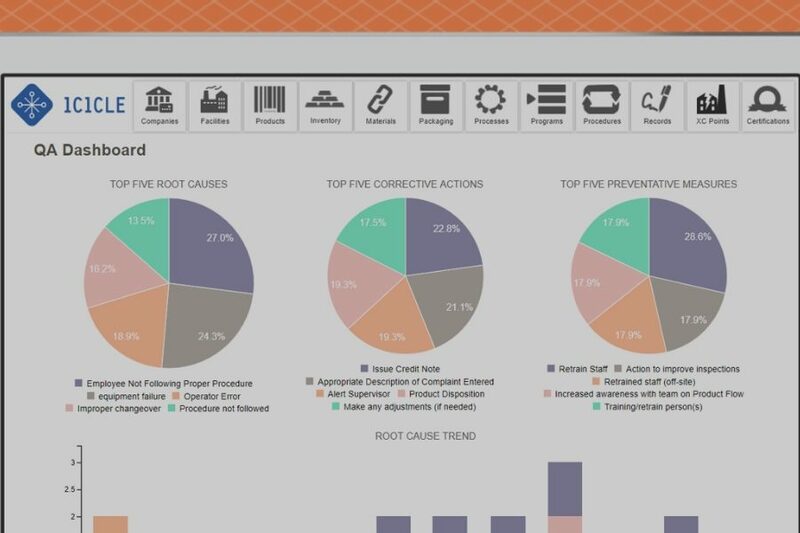 With just a quick glance, you can now see the top five root causes of your incidents, the top five corrective actions taken, and the top five preventative measures in use. For root causes, Icicle will also show you a trend over time so you can verify that your preventative measures are effective. 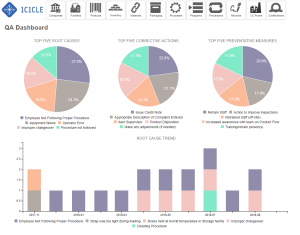 With the QA Dashboard, Icicle provides an invaluable window into the problems you are facing so you can see if there is anything coming up more often than it should. It will also point you to procedures or training that can be implemented in order to reduce the number of incidents going forward! Where did the idea come from? This great idea comes from Chris from Ontario Pride Eggs! What does it do? Formula Checkpoints allow you to divide your production run into different checkpoints at each stage of production. Directly in the formula, you can now pre-define each stage and maintain a record of the duration of each stage. You can start and stop timers so that you can also time each phase of the production process. This allows you to gain tighter control over your production, which increases safety and quality and mitigates the risk of spoilage and waste through timer controls. You also have even better, more detailed records for your audits. The next phase of this cool new feature is to take it further so you can also conduct QC checks at certain stages of the production process and allocate labour, so you can also keep track of labour costs. Where did the idea come from? Thanks to the team at Daiya Foods! What does it do? The new Corrective Action Report is a searchable, sortable, and comprehensive list of all corrective actions in your organization. You use this data in all sorts of ways: you can filter the list to see all customer complaints for a particular facility or date range, find a particular corrective action, undergo a performance analysis of a team or individual, or look up the history of corrective actions taken for a previous incident to guide you today or tomorrow. Icicle provides a convenient way to slice and dice corrective action information any way you like! Where did the idea come from? This is one of those feature releases that come from the collective mind of the Icicle development team. What does it do? You can already see all corrective actions in the previous feature release, but the Corrective Action Aging Report looks specifically at corrective actions in relation to their due date and the employees assigned to them. This handy report, which displays as a grid, not only gives you a snapshot of corrective actions, but it also shows you key performance indicators so you can easily assess which employees have the heaviest or the lightest workload, who keeps on top of their tasks, and who takes too long. The Corrective Action Aging Report also helps you out when it comes to inspections. When an inspector issues a corrective action request, you only have so long to complete it before the inspection agency can levy an administrative monetary penalty (AMP). This report helps you keep on top of corrective actions, mitigates the risk of being fined, and ensures safety and quality. Some corrective actions are related to things like customer complaints, so keeping on top of your corrective actions can also go a long way in managing customer relationships and maintaining your stellar reputation. You can find this new report under corrective actions, as part of Icicle’s incident management infrastructure. Where did the idea come from? Another big thanks to Chris from Ontario Pride Eggs! What does it do? In the past, you could only assign a corrective action to an individual or leave it unassigned, which meant that it didn’t display on your dashboard. Since you may not always know immediately who to assign the corrective action to, we have now set up the possibility to assign corrective actions to a team. Say you have a corrective action for the maintenance team, but you don’t know who will be available on Friday. You can assign the corrective action to the whole team and re-assign it to an individual at the appropriate time; in the meantime, everyone in the maintenance team can see the corrective action in their dashboard. This allows you to get ahead of the work and assign the corrective action so it goes into play right away, even before you know who is available. Where did the idea come from? Yet another great idea from Chris from Ontario Pride Eggs! What does it do? Some feature updates are just simply about saving you time. Previously, when you needed to assign training tasks, you would go to a procedure (for example, a sanitation procedure) and you would need to assign a task to train somebody (for example, on the maintenance staff). We know that sometimes, a whole team needs to be trained. Instead of having to assign a new task to each person, we’ve added a team option that lets you select the team so that Icicle can automatically create tasks for each team member, instantly. Where did the idea come from? Chris from Ontario Pride Eggs really does have a mind for efficiency. What does it do? Here’s something that many Icicle users don’t know – buried in the depths of the Administration section, you can actually already create preconfigured incident templates. For example, say a recall occurs and you need to complete a series of tasks…notify the authorities, hold the product, etc. Many of these templates already exist in Icicle, but you can also create your own. We’ve taken it one step further. Now, when you create your own incident templates, you can also add a default assignee (the person assigned to the task) and a default number of days before the deadline. This can help you save a ton of time and keep your business running smoothly by automatically assigning workers and setting deadlines for new corrective actions! You can find this nifty feature in Icicle’s Corrective Actions section. What does it do? Several users have approached us about this common problem that they just knew Icicle could solve. Say you need 155 litres of olive oil in your formula. The inventory unit of olive oil in Icicle is set to litres, but when it comes to purchasing the ingredient, the supplier sells in 40-gallon drums! The receiver now needs to convert the original order amount to what has been received, which can result in extra work and the possibility of human error. Now we’ve added an ordering unit attribute in Icicle where you can easily add a conversion factor (like a 40-gallon drum is 151.41L). When the 40-gallon drum comes in, Icicle will automatically do the conversion for you and show that you have 151.41L of olive oil in stock. It’s just that simple! Where did the idea come from? Though we’ve discussed this with a few people, the credit has to go to long-time Icicle user, Paul from P&S Frozen Foods. What does it do? Say you’re making 100 cases of chocolate chip cookies. You know that you need so much butter and flour and other ingredients. Your formula also includes how much materials you need to use, like so many metres of parchment paper. But at the end of the line, you also need 400 vinyl liners, 400 printed paper boxes, 100 corrugated cardboard boxes, 100 labels and 200 ft of tape! All of these are not ingredients or materials – they are packaging, which could be assigned to a product but wasn’t previously included in the formula. Now there is a new region in the formula to add packaging quantities so that you can easily define how much packaging you need for a particular batch size and forecast how much you will need for a production run. This is a huge help to the person in charge of procurement since this information is now used by Icicle to suggest how much packaging should be ordered based on sales orders and planned production. Where did the idea come from? A big thank you to Andrew from P&S Frozen Foods for this useful idea! What does it do? So that last feature on packaging in formulae is pretty handy, but it led us to a bigger – and cooler – feature: Purchasing Suggestions. Icicle now has a new interface that looks into all production runs that have been planned and sales orders that have been booked. It will tell you – for ingredients, materials, and packaging – whether you have enough in stock to make your planned production and will suggest how much you should order to meet your production targets. When Andrew from P&S Frozen Foods told us that he was spending about 25% of his time going through planned production and inventory to figure out how much is in stock and how much he needed to order, we knew there was an opportunity for Icicle to cut that time to almost zero. The new Purchasing Suggestions feature allows you to see all required ingredients, materials, and packaging on hand and how much more is needed to satisfy booked sales orders and planned production volumes. Where did the idea come from? The credit has to go to Andrew from P&S Frozen Foods. What does it do? Since Icicle now suggests the amount of an item you should order, it’s important to make sure that you don’t order more than you can handle, specifically in terms of inventory space. Say you’re ordering trainloads of wheat. You only have space for 6,000 tons of wheat, but your sales ordering and production forecast says you need 20,000 tons of wheat. The problem is that you don’t have enough space! Icicle lets you set maximum inventory levels that prevent you from accidentally over-ordering and exceeding your storage capacity. Where did the idea come from? This smart idea comes from Scott from Tree Island Yoghurt. What does it do? If you’re shipping from one internal facility to another, you no longer have to re-enter the information at the receiving facility – with Icicle, you can just select the shipment from the originating facility and the contents of the shipment will populate automatically. This helps save you and your employees huge amounts of time and reduces the risk of human error – no more lost inventory due to simple mistakes. Where did the idea come from? Thanks to Simon from the Chai Company for this good idea! What does it do? A simple little feature, the new comments field at the bottom of shipping and receiving records allows you to make little notes like the fact that a shipment arrived late. Where did the idea come from? Thanks to Nadia from Aliya Foods for this one! What does it do? Comment fields seem to be in vogue right now, especially when they are private to your organization. This new comment field allows you to leave comments on inspections that you can choose to flag as private so that only the people in your organization can see these comments. This can work for food processors, but also inspectors who can share private information visible only to other members of the certification body. Where did the idea come from? This idea comes from Rabbi Mendy from KosherCheck! Keep up-to-date with the latest Icicle features by signing up for our newsletter! If you have a feature request or question, submit a request and our team will get back to you quickly.